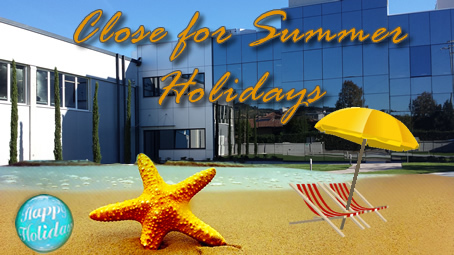 WE WILL BE CLOSED FOR 2018 SUMMER HOLIDAYS FROM 10TH TO 19TH OF AUGUST INCLUDED . No shipment and production of goods in this time. OUR COMMERCIAL OFFICE WILL BE OPEN STARTING FROM THE 20th OF AUGUST. We reply at all yours fax and e mail only after 20th of August. Our company is totally closed the central week of August (Aug.10th to 19th). The week later (20th to 24th) production and offices will be operating with reduced number of people. WE WISH YOU A NICE HOLIDAYS ! SAREMO CHIUSI DAL 10 AL 19 AGOSTO 2018 INCLUSI, PER LE CONSUETE VACANZE ESTIVE. IL NOSTRO UFFICIO COMMERCIALE SARA’ NUOVAMENTE A VOSTRA DISPOSIZIONE A PARTIRE DAL 20 DI AGOSTO . In aprticolare siamo totalmente chiusi nella settimana centrale di Agosto (Aug.10th to 19th). La settimana successiva (20th to 24th) la produzione e gli uffici saranno operativi a numero ridotto dipersone. CON L’OCCASIONE VI PORGIAMO I MIGLIORI AUGURI DI BUONE VACANZE.